« Firefox 4 : Missing status bar! In Ubuntu 10.10 maverick meerkat, the default setup of bluetooth would not allow you to automatically receive files over bluetooth. For every file(s) transferred you have to manually accept the request. This gets annoying when you have to send multiple files sitting away from your System. This can be fixed. 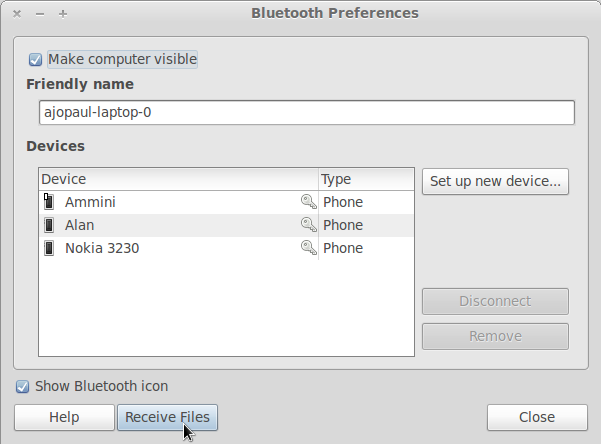 Goto System->Preferences->Bluetooth as shown below. Click on Receive Files. Most probably you might see the error mentioned below. To fix this install the following program . Now when you click the Receive Files from the bluetooth preferences dialog. The following screen appears. Make the settings as shown in the image. Restart bluetooth service and henceforth your system will accept files without confirmation from your bluetooth enabled mobile device. Hey dude, is there any help for run bluetooth in MATE (Ubuntu 12.04 LTS)? I used this solution on 11.10, it works fine. 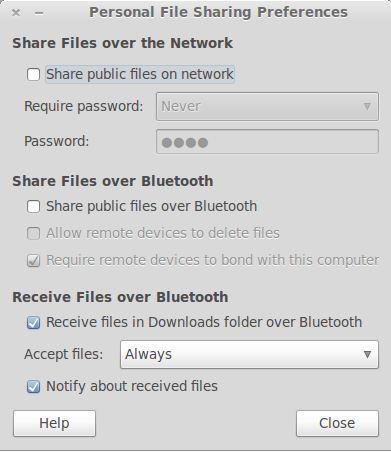 The new versions of Ubuntu comes with Unity instead of Gnome, but you can still install the “gnome-user-share” package to manage your bluetooth conections, when you install the package you just need to search for it in Unity as “Personal file sharing”. Thanks, frankly haven’t tested it with 12.04. Will do it and update if required.